The FiF is a purpose built, scalable and relocatable facility for high volume, high quality, manufacturing of Big Dishes on the power plant site. It includes automated quality assurance ensuring a globally consistent high-quality approach to solar field deployment. The FiF reduces solar field deployment costs, accelerates project development and maximises opportunities for local employment and suppliers. The FiF delivers rapid and cost-effective solar field deployment. 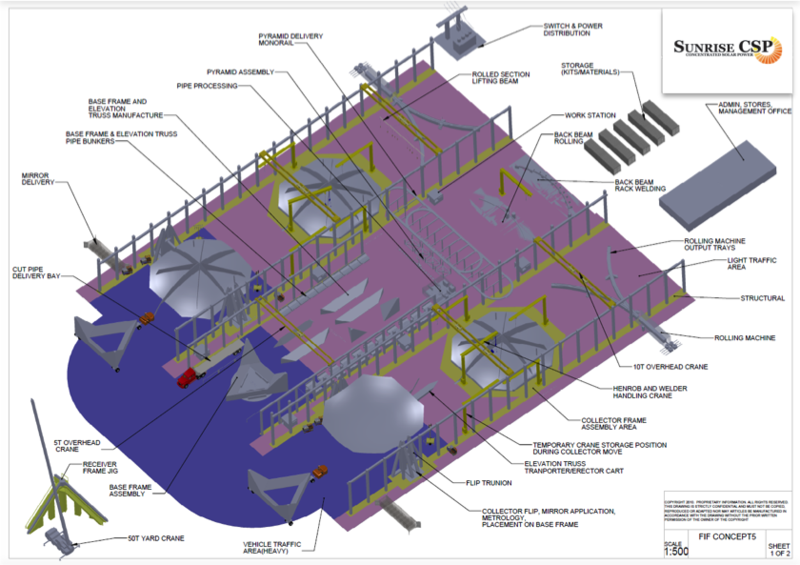 The baseline FiF production module is designed to deliver 320 Big Dishes per year (~40MW). Larger solar fields, requiring a higher rate of dish production, can be accommodated by installing additional FiF modules. The FiF includes operational options for automation, labour content, equipment and materials sourcing, which are adaptable to suit regional circumstances, facilitating local supply and manufacturing. Materials (e.g. steel pipe, steel coil) and “kits” (e.g. fasteners, dish motors, electrical and control systems) are delivered to site. Dishes are manufactured on site using structural materials which are transported by weight not volume, significantly reducing transport costs. Materials are processed just-in-time using purpose built equipment, minimising materials handling and warehousing. Low-tolerance parts are assembled on high-tolerance jigs, resulting in a precision structure, rapidly built from inexpensive on-site fabricated structural components. Integrated and automated quality assurance using advanced laser measurement ensures a globally consistent high-quality approach to solar field manufacture and deployment. The FiF ensures that multiple Big Dish solar power projects can be under construction in many locations around the world simultaneously. Flexibility in manufacturing labour, materials and equipment supply, maximises local content and promotes community and Government support. The FiF supports at least 60% local content for the solar field.